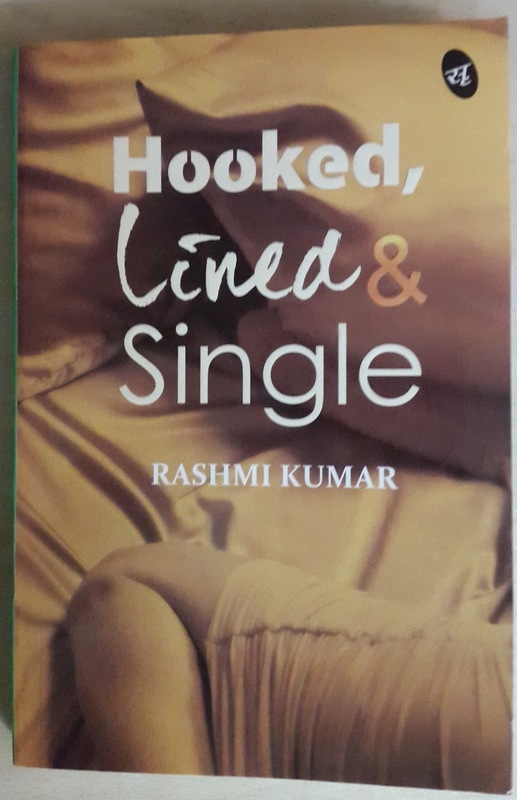 Hooked, Lined & Single is written by Rashmi Kumar and published by Srishti Publications. I have received this book for Blog-A-Ton - 55 winning post The Monsoon Pain. 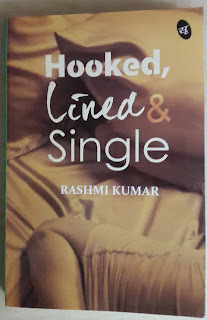 This book is an fictional account of a girl's efforts to find a right match after a failed marriage. Cover : It fails in the sensual look it is trying to give. Although the hints at loneliness in narrator's life from both aspects emotionally and physically is conveyed through this picture. This I think not one of the best to go with the story but an apt one. Plot: A divorcee author in her 30's Alafia Singh is desperate to find a perfect match and is taking help of a matrimonial site for the same. The many men that came in her life through this means only add to misery to her all ready troubled life. She was used by those men either sexually or emotionally thus to hurt her from the core. After her younger sister's marriage she decided to take a firm decision on her marital status. The story revolves around the path she took to find a right destination for her. Highs : The rawness in the narration impressed me. The character of open minded independent girl came out superbly with the narrative. The marriage scene of Alafia's sister presents the true image of Indian marriages. All men characters were different from each other giving a humor to the narrative in anecdotes about them. Lows : The story was stagnant and moved an inch only in the end to give a one line message of the book. I feel the narrative was coming back to the same point after each change of scene without adding much to the story line. The author seems confused in building the plot. The way it ended lives the reader cheated. Even philosophically it has not much to offer. Verdict : A good read to know an open minded independent girl's psyche who is in her 30's and is a divorcee. Rating : I give it 1 out of 5. Liked your verdict. You're indeed a dry honest. Despite giving 1 out of five 5 to it, you didn't forget to mention the good aspect of the book. And, I really want to explore the psyche of an independent open minded divorcee in her 30's. Hope I don't feel like being cheated at least in this sphere of book! I just put forward good and bad aspects of a book and then let readers decide what to do with it.